An easy ecommerce workflow maker that helps make ecommerce workflow diagrams with free templates. Quickly and easily create ecommerce workflow diagrams in minutes. Discover why Edraw is the simplest and easiest, yet most powerful ecommerce workflow maker: Download it Now. 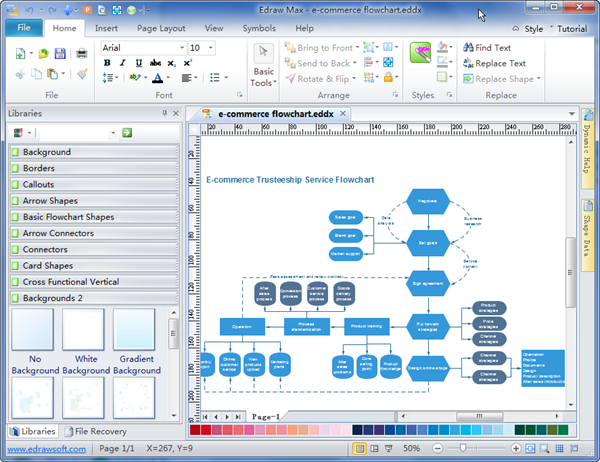 Edraw ecommerce workflow maker equips you to create, copy, share and print ecommerce workflow diagrams. The symbols, templates and examples allow you to save time and effort. The in-built themes help you beautify diagrams with only one click. The user-friendly interface similar to MS Office enables you to get proficient quickly. And the complete compatibility with MS apps gives you the flexibility to gain efficient team work easily.